1) A trip on the infamous ‘bamboo train’ is an absolute must for anybody visiting Battambang. These makeshift trains, known locally as Norry (ណូរី)) are located just outside of the city limits of Battambang. Powered by a six horse power engine and speeding along at 50 km/h makes for an exhilarating ride. The return trip costs $5 per person; however, I must warn you that when you reach the midway point you’ll be hassled quite aggressively to purchase sodas and tip your driver. 2) The rural countryside and village areas outside of Battambang beckons cultural vultures. The opportunity to sample local delicacies such as bamboo sticky coconut milk rice and even fried crickets are not to be missed. Aside from sampling food, explore rural homes to witness how rice cakes and scarves are made using simple tools and human powered instruments. Finally, spend time wandering down many of the colorful local markets. 3) Although Battambang is a city that is highly negotiable on foot (especially in Cambodia), hopping on a bicycle and pedaling around to your hearts content is even better way to get around. Some of the top highlights include biking along the scenic Sangker River, Old Railway Train Station and the Governor’s House. Along the way you’ll notice a plethora of Buddhist temples (know locally as ‘wat’) along with some gorgeous parks which make perfect rest stops. 4) There are plenty of restaurants to indulge in local Khmer dishes; however, an even better opportunity is to learn how to make Cambodian food yourself. Nary’s Kitchen offers half day cooking courses for $10 which includes a trip to a local market along with preparing three dishes. One of those dishes, Amok (steamed dish in a coconut cream sauces served in a banana leaf) is native to Battambang. The other two dishes, Lok Lak and spring rolls are equally as fun to make. 5) Visiting one of the many temples that are dotted all over Battambang is highly recommended. We were fortunate enough to visit one during Khmer New Year (Cambodian New Year) when celebrations, festivities and other special events were taking place. 6) The rural outskirt areas of Battambang are quite a distance from the city center; therefore, it’s a great idea to hire a tuk-tuk driver for the day to help you explore. The ride itself should cost no more than $12 for the day. If you’re looking to only do a half day tour you can negotiate a better rate. 7) Finally, don’t leave Battambang without first watching the incredible ‘New Circus’ Cirque Nouveau performance at Phare Ponleu Selpak. The highly skilled Khmer youth who perform at this circus will mesmerize you with their acrobatic, juggling and acting skills. Moreover, the event is all for a great cause, as the proceeds go towards supporting the NGO school for disadvantaged children. Cambodia has these much attractions? I was not at all aware of it. Thanks for the share. On arrival in Phnom Penh, transfer to your hotel. Plunge straight into the streets of Phnom Penh with a thrilling cyclo ride immersing you into this fascinating city followed by a visit to the central market. In the evening meet your tour leader and small group of fellow travellers for welcome drinks. Admire the beauty of the stately grounds of the Royal Palace, marvel at the silver-lined floor of the majestic Silver Pagoda, and gain an insight into Khmer history at the National Museum. In this city of contrasts, reflect on the Khmer Rouge legacy on a visit to Tuol Sleng, plus learn about the plight of local street children and what you can do to help at the ChildSafe Centre. In the evening, you might take a stroll along Sisowath Quay, enjoying the cool river breezes along with the locals. Nice videos! I walked all the way from the guesthouse near the market in Battambang to get to the Norry and I wasn’t able to ride one. Budget constraints but my travel buddy doesn’t want to share the Norry ride with other people…ugh, the dilemma. I did get in free, after hitching a ride, to Wat Phnom Bannan. You were in Siem Reap the same time I was this month, next time I’ll say “hi”! Nice tips….i watched all video. Nice videos! So great to have a video memory of your journeys, isn’t it? Nice one! We spent our time in Siem Reap, but now I wish we had seen Battambang. Seems like you guys are having a great time and are fitting (back in) nicely with backpacking! So glad the Bamboo Train is still going. When we were there 10 months ago they were all talking about it shutting down. Sounds like they have been talking about that for a long time. Great tips man! 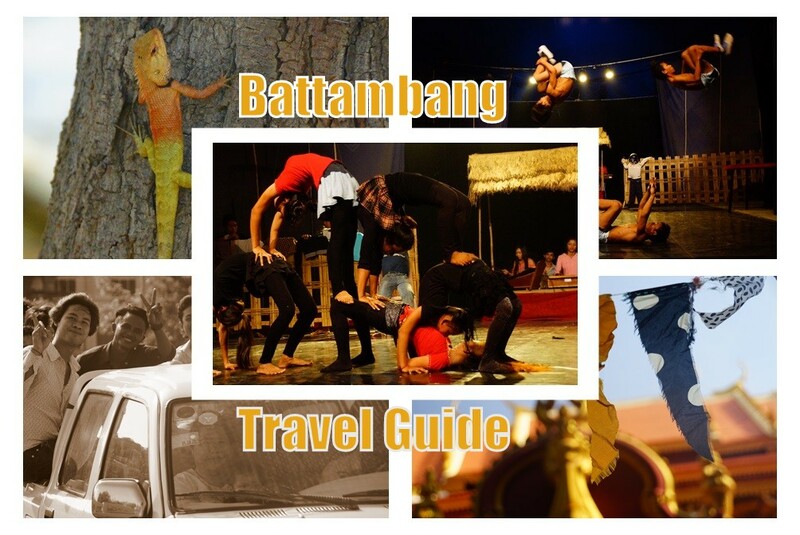 I’ve heard a lot of good things about the Battambang Circus too, maybe one day I’ll check it out. The bamboo train ride was awesome! Neat stuff on the cooking class video too. The husband and I have some friends from Cambodia. We love whenever we get to go over to their house and eat. So tasty! Love the idea of taking a class while visiting there. I sure hope you remember. That found looked tasty! Thanks Bethaney! We’ve been going a*little crazy* with all of the videos lately…LOL Hopefully we can continue to make them often but I have a feeling we’ll be slowing down at some point.